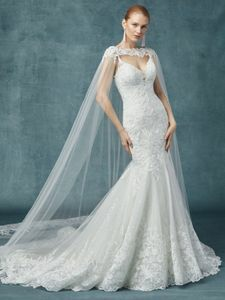 Description: Romantic lace motifs drift from bodice to hemline in this boho wedding dress, with shimmering swirls of sequins along the fit-and-flare skirt. Beaded spaghetti straps complete the plunging sweetheart neckline and scoop back, both trimmed in illusion. Finished with crystal buttons over zipper closure. Tulle cape trimmed in lace along the neckline and hem sold separately.